Homerun Hotdogs is a recent discovery we made earlier this month. It is a food stall located in the second floor food court of Trinoma, sandwiched between Pao Tsin on the left and Maru Maru (a new Japanese food stall) on the right. Homerun isn’t a new stall or anything, but for the longest time we haven’t tried that because they almost always never have any customers. We recently developed a craving for hotdog sandwiches, and Homerun seemed like a good candidate. Our first try left a very favorable first impression, that we ended up going back a couple of times more. We were able to try all of their sloppy joe offerings, and all types of their hotdogs (regular, frank, Hungarian) except the cheesedog. Here are pictures of what we ordered the last time we went there. Texas BBQ Regular – It had ground beef and tomatoes as toppings, and their barbecue sauce. This was just an okay sloppy joe. Hell’s Kitchen Regular – It looks remarkably like the Texas BBQ one, with the same ground beef and tomato toppings. In addition, it had some red pepper slices, and hot sauce. It tasted better than the Texas BBQ since it was spicier. This is The Man’s personal favorite. Triple Cheese Frank – As the name suggests, it has three kinds of cheese topping: a bottom layer of melted chizwhiz, a generous sprinkling of grated processed cheese (like Eden), and around 3-4 strips of cream cheese on top. I chose franks because it’s supposed to be made of beef, and the regular hotdog was pork (I avoid pork as a rule). This is my favorite. The other types of sloppy joes not pictured are: New York Supreme (tomatoes, onions, pickle relish toppings), Heart Stopper Supreme (bacon and egg toppings; yes, egg! ), and Garlic Cheesesteak (ground beef, cheese, and garlic toppings). Garlic Cheesesteak is my next favorite. Heart Stopper is just weird with that egg topping. New York Supreme is good because it has pickle relish, but bad because the onions aren’t cooked enough (almost raw!). The sloppy joes were quite filling and satisfying taste-wise, especially our favorites. 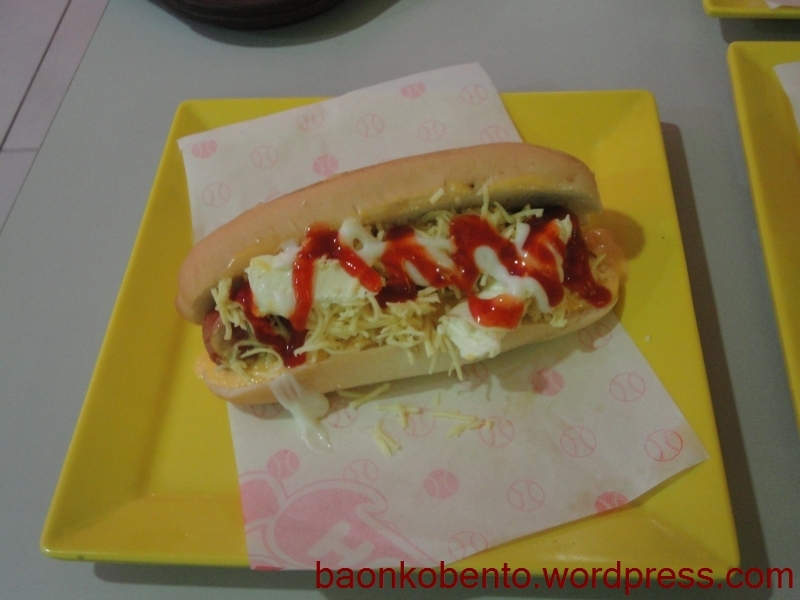 For Php55 per sloppy joe with regular hotdog, it’s not a bad dinner choice. The Man considers two sloppy joes more than enough, and for me, one already hits the spot. Upgrading to franks will cost Php79, while getting the Hungarian sausage will cost Php89 (the most expensive type). The service is well enough; since there’s almost never any lines, you’ll get your order relatively fast. They fry the hotdogs and ground beef and toast the bread, so the sandwiches are served hot and fresh. They offer you your choice of condiments: mayo, ketchup, mustard, and hot sauce. The Man usually asks for everything! We get our drinks and side dish elsewhere, though. Since Homerun is located in a food court, there’s nothing stopping us from ordering other stuff from the other stalls. 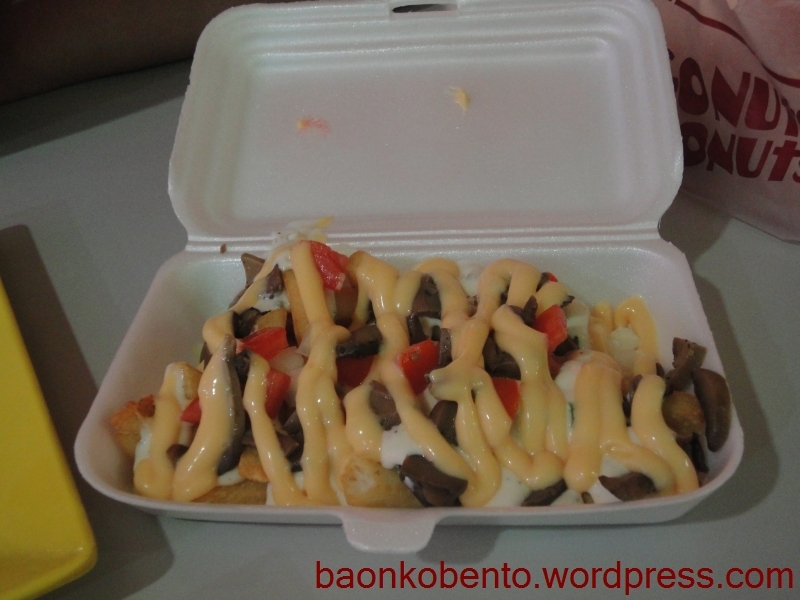 Our mainstay side dish is this big order of fries topped with mushrooms, tomatoes, onions, and melted cheese from the neighboring Slammers Burger. 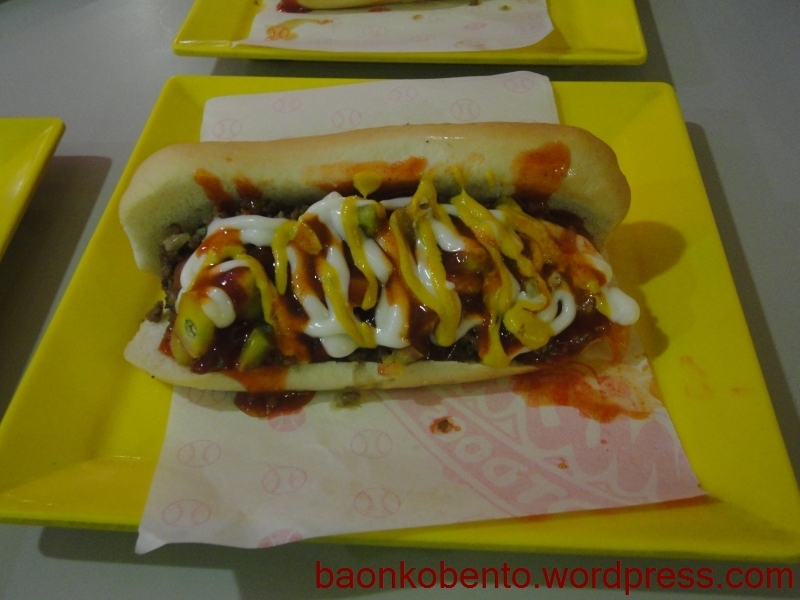 Summary – A great inexpensive place to get great hotdog sandwiches, served fresh and hot. Make sure to say that you’re dining in (if you are), so they’ll use those nice yellow plates instead of the default cardboard box. Sayang sa trees! Depending on your dining time, it might be a little difficult to get seats.